Taking a well-established genre and putting a personal take on it is a hard thing to achieve. I remember watching The Cabin in the Woods and loving every bit of it because director Drew Goddard was able to take everything I loved about horror movies and flip it on its head. All of the tropes were still there, but were presented with a much different effect. When I heard about Bad Times at the El Royale, it was clear this was Goddard’s opportunity to put that same kind of spin on the mystery genre. 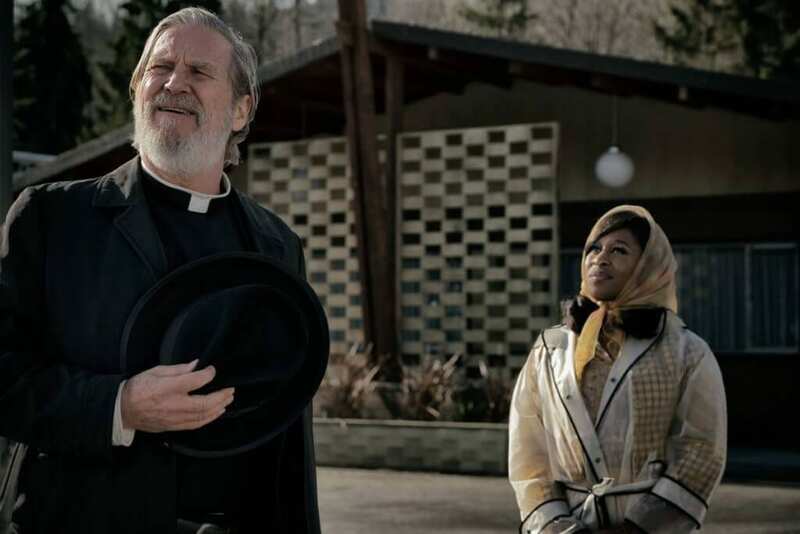 I can’t say it was as successful as The Cabin in the Woods, but there’s a lot to like about Bad Times at the El Royale. Bad Times at the El Royale is about a weird hotel named the El Royale located between the states of Nevada and California. One day a salesman, a priest, a singer, and a woman with a bad attitude all check in for the night. Each of them carries their own stories, and as the night progresses, we see how all of them converge. I really do love the way Bad Times at the El Royale is structured. People have compared it to Pulp Fiction, which is a well-deserved comparison. After the initial scene where we’re introduced to the characters, everyone retreats to their hotel rooms and the fun begins. We get to see how the story unfolds from each person’s perspective in order to get the bigger picture of the movie, which often results in seeing the same scene twice, but from a different angle. This is far from the first time we’ve seen this storytelling method, but it’s an extremely effective way to flesh out the cast and their motivations. One of this film’s biggest strengths is its ability to mask its characters’ true intentions. There are certain scenes early on that are there to throw us off about the guests. What you see is definitely what’s happening, but the true context behind those actions is pulled back layer by layer as the movie gets deeper. This is especially true for Father Flynn, who is a lot more than he might seem at first and second glance. The hotel itself works as its own character too. There are cool quirks to it that the audience learns about gradually. There’s an observatory room where staff can look into all of the guests’ rooms. This results in some really great shots where we see what people do when they don’t think they’re being watched. The hotel also falls between the border of Nevada and California; other than contributing to a unique and beautiful hotel design, it has no significance in the story. Pretty much everything about the hotel itself never gets explained, which is disappointing considering how creative the design choices are. The characters turn out to be just as mysterious as the hotel is. No one is exactly who they say they are, and they all carry a pretty heavy backstory with them. My favorite is definitely Father Flynn, who is a priest with a horrible memory. My perception of him continuously changed, and by the end of the film he ended up being a sympathetic character that has some truly heartfelt moments. They even take the time to give a spotlight to Miles, who is the only employee at the El Royale that we see. Once he meets Father Flynn, he tries to confess his sins. It’s unclear for the majority of the film what his sins are, but when we’re told, it leads to the most satisfying moment of the entire movie. There isn’t much of a narrative focus in this movie, so it’s really up to the ensemble cast to deliver and make up for that. Bad Times at the El Royale often feels like it was made simply to give this talented cast a playhouse in which to go crazy. If that was the intent, then they definitely pulled it off. Jon Hamm is hilarious as Laramie Seymour Sullivan. His delivery is intentionally over the top, and it comes with an obviously fake accent; it’s clear from the beginning that he’s having a whole lot of fun. Jeff Bridges as Father Flynn gives the most subtle performance in the movie. He commands such a great presence on screen that it’s hard to take your eyes off of him. Cynthia Erivo does a fantastic job as Darlene. She’s asked to do a lot more than the rest of the cast, and she excels at every turn; even her singing sounds great. Dakota Johnson really needed this movie to shake off the image of the Fifty Shades of Grey franchise. She’s given the most straightforward character in the film, but that doesn’t stop her from giving a pretty good performance. Chris Hemsworth is the standout, though. He plays this cult leader that appears in the third act, and it’s shocking watching him work. I would’ve never believed that Hemsworth had this type of performance in him. He oozes charisma with every line he delivers. Director Drew Goddard pieces this movie together with some visually striking cinematography. There’s this really cool shot of someone looking into each of the guests’ rooms; it looks as if he’s staring into a bunch of windows and it’s creepy. There are also some impressive point-of-view shots during conversations between Father Flynn and Darlene. The film’s editing makes sure that the story and flow of the plot remain coherent. There are a lot of stories being told at once, and the narrative never feels like it’s stepping on its own feet. My only problem with the direction is that certain shots linger way too long. These lingering shots don’t add any lasting effect to the moments either, so it comes across as a director becoming too self-indulgent. Bad Times at the El Royale is a fun movie with a great ensemble cast. Everyone pulls their weight to make this an enjoyable viewing experience that explodes once the third act begins and Chris Hemsworth is on screen. Along the way, the tone does shift from goofy to extremely dark, but nothing feels out of place. Drew Goddard does his best to make sure his vision comes to life exactly the way he wanted, but at times it feels as if he should’ve been reigned in. He constructs an incredibly creative setting for this film but fails to truly capitalize on it. I will say that the lounge area of the El Royale is one of my favorite sets this year. If you want to see a movie with good performances and a very different presentation, then I suggest you check this one out. Bad Times at the El Royale is fun mystery movie about many characters with personal stories that just so happen intersect. With its bare-bones plot, it relies on its cast to deliver charismatic performances to carry the film.